My Advanced Kitchener workshop had it's first airing at Edinburgh Yarn Festival this March. It wasn't an easy workshop to describe, or deliver for that matter. Whilst some students may have felt daunted and many students would have had the penny drop some time later, there were a number of students who 'clicked' within the 3hrs and absolutely loved it. It isn't an easy subject, but it's not difficult, either. Let me go into a little more detail, in response to some feedback I received, and to help demystify this oh so favourite subject of mine. I asked for feedback at the end of my class at EYF, and the one thing that rang through was the wish for an intermediate level. I completely appreciate that a jump from regular Kitchener (or my beginners class) may seem a jump too far. I do see that, I promise. But there isn't an intermediate level. Once you want to move beyond grafting stocking stitch, reverse stocking stitch, garter stitch and reverse garter stitch (all things I cover in my Kitchener Stitch - an Introduction class) then you have to make the leap - there's no other way to do it. Why? Well, because we have to change how we see grafting. And that's no bad thing. When I was writing my first book, Going Straight, I knew how difficult it might be for some to get their heads around the sideways construction. Even my tech editor wanted some breathing space around other projects. That 90 degree shift in thinking is subtle, and it seemingly turns everything upside down (which of course, it doesn't... it's a mere shift...) and it can take a little getting used to. But once your brain has adjusted, it's pretty much plain sailing. It's no different with grafting. What you know about grafting now - working the two selvedge stitches then launching into a routine of working two stitches on the front needle then two on the back - subtly changes. It's a minor change. And if you think about it, you're still doing the same thing except you're starting the routine at a different point. Instead of working two stitches on the front needle, two on the back.. you start to work one stitch on the front needle, two on the back, then one on the front. In a nutshell, that's it (there's a little bit more, which I explain in the class) but that really is it. It's all very well for me to say it's not rocket science as the one who's teaching it, so I won't. But it isn't beyond anyone. To some extent it's easier with less understanding of the common Kitchener stitches, mostly because there's less habit to be undone. The class is a fresh perspective on a subject that many find daunting. And that fresh perspective describes the whys and wherefores, the engineering behind your stitches. It's eye opening. I'm teaching this class at Woollinn, Dublin, in a few weeks. As I've mentioned before, due to my health and stuff I'm take a long break from travelling to shows and teaching workshops, so I'd grab this chance while you can to come and pick my brains in person. This blog post was bought to you from my new studio with the support of a new wrist brace. More about the new studio shortly. Edinburgh Yarn Festival is drawing ever closer, and here's a reminder of the homework for each of my classes. In this class we'll cover a couple of basic styles - beanies and slouchies - and for this you'll want a yarn that knits up pretty quickly (Aran weight or heavier), needles to give you a firm-sh gauge (go down a needle size or two if you're not sure) and an idea of your gauge. Needles should be DPNs, short circs or whichever method you prefer for knitting in the round. A few balls of oddments - 50g each or so - and needles to match; DK weight or heavier. A tapestry needle is essential. Needles can be any tpe. Please also knit two swatches of stocking stitch, and two swatches of garter stitch. Swatches can be any size, minimum 20 sts and 20 rows. Don't cast them off, leave them on the needles or waste yarn. Extras: crochet hook and a few metres of waste yarn. At least 2 x 50g of two different coloured yarns of the same weight - DK or heavier. Needles to match. The more colours you bring, the more interesting your swatches will be! Needles need to be able to take 40sts at gauge. A crochet hook will also be a big help, as would hooked markers or the safety pin variety. If you're feeling adventurous, swatches of your favourite cables! I hope this covers everything! Leave a comment below if I've missed anything. See you there! The teaching schedule has now gone live for Woollinn, a full week ahead of when booking opens! Edinbugh Yarn Festival and Woollinn are my only teaching bookings for next year, so if you're keen to take a class you may want to have a persual at the workshop list and see what takes your fancy. The event is well situated in Dublin, close to the airport which itself is not too far from the city centre, making it very accessible for travel. And of course, it's Dublin - you can't go wrong. I'll be spending the weekend in great company - Carol Feller, Karie Westermann, Justyna Lorkowska, Nancy Marchant to name but a few (and I'm looking forward to catching up with each of them ;). With so many great tutors, a great city and fantastic organisers (the crew at This is Knit are amazing) it's guaranteed to be worth every penny and then some. My October teaching tour is now finished, and I have to thank the folks of Bath and Inverness for their hospitality! I got to see some beautiful parts of the UK and share in the love of knitting techniques, especially that of circles and knitting sideways. I fell ill over the weekend at Lock Ness Knit fest and I'm still in bed trying to shake this lurgy. I got back to the bus 2 days ago and have barely moved from this spot, and it's confirmed that I need to slow down with teaching, and maybe even grind it to a halt for a while. Don't get me wrong - I love teaching. I love sharing what I know and seeing that knowledge spark new ideas. But I've been through teacher burnout before, when I used to be a full time teacher in schools, and I promised myself that I wouldn't let that happen again when I started teaching privately. I don't teach often - during this season I'll have taught a total of 23 x 3hr workshops (or 12 full days) across 6 venues, with a weekend spent at each. That's a lot less than many teach but it's too much for me right now. Given how easily I get exhausted and how painful it is trying to travel with two frozen shoulders, I've decided to not teach at all during Autumn/Winter 2018. Travelling is also difficult with a specialist diet and I get such anxiety about eating out (fear of being dosed again) and it'd be nice not to worry about that, too. After I'd completed my year end accounts I saw that financially, I could afford to teach less and indulge in more creative studio time (which is where most of my income is generated); thanks to Elemental, this year is going to be even better and I'm going to use that to buy myself some time off. So, that's my plan. From May 2018 until Spring 2019, I'll not be teaching anywhere. I won't stop teaching altogether; I've retired a few workshops that I no longer enjoy teaching, and added a couple of new ones that I know I'll love. I've updated my T&C to be kinda to me, which was really hard as it feels less kind to small shops, and I'm hoping they'll understand. The photo above is the crown shaping swatch for Circled 2. 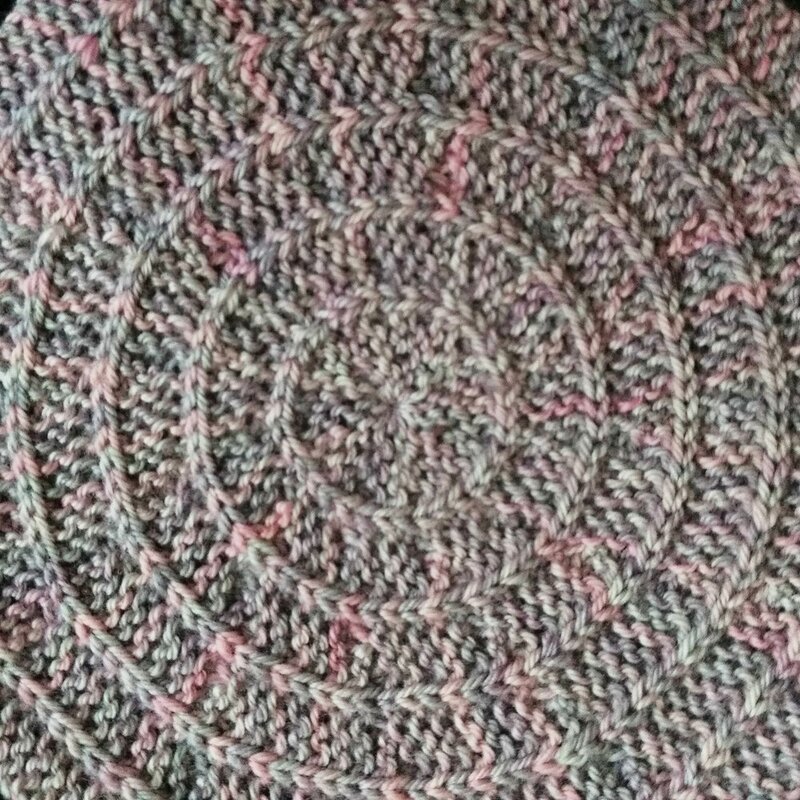 It's one of my workshop samples for Art of the Knitted Circle and Turning Sideways classes, and will also form part of the new Advanced Kitchener class. I've been thinking about circles a lot lately (more than usual, at least) and I'm really excited to have some studio time in the near future. It feels like such a luxury to have this to look forward to. Before I go, my November teaching tour kicks off in just under 4 weeks, and you'll find me at the Devon Sun Yarns retreat in Lyme Regis and at Purlescence for a whole weekend of knitting sideways! See you there? Otherwise, the only other places you'll be able to take a workshop with me for the foreseeable is Edinburgh Yarn Festival and the Woolinn in Dublin. 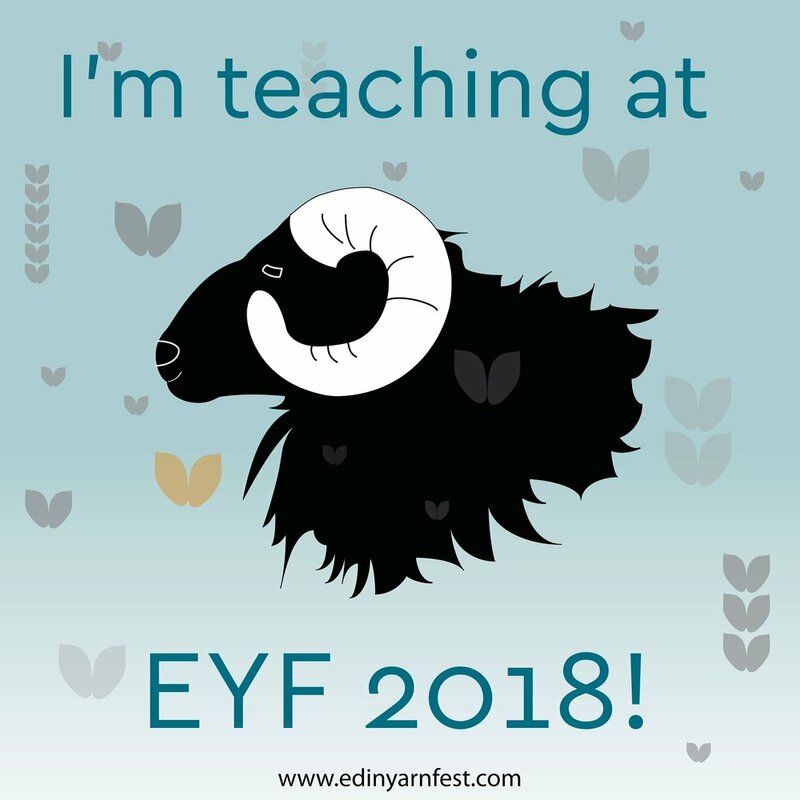 I'm teaching at Edinburgh Yarn Festival again! With the workshop sign-ups opening very shortly, I though I'd give you a quick run down of what I'll be teaching? I'm excited to be going back again - it's an incredible well organised event, with so much to do and see (possibly too much?!) and I can't wait to see everyone again. My classes include An Introduction to Short Row Colourwork (ala Elemental! ), An Intoduction to Kitchener Stitch (sensing a theme here? ), Advanced Kitchener Stitch (you know you want to) and Hat Design, where we'll design our own custom fit beanie (with or without slouch). This latter class is similar to my Hat Design Masterclass, but as it's only 3hrs instead of 6hrs, we'll focus on specific shapes and structures to ensure everyone achieves a Hat. And you can find all of my classes on the EYF website!